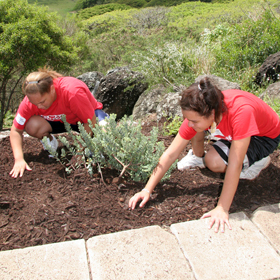 REBIRTH » Kailua High School students Hiwalani Naki and Chelsea Oden spread mulch on rocks overlooking Kawainui Marsh as part of a service learning project at Na Pohaku o Hauwahine. A recent city-state agreement means the state's largest natural wetland is on the verge of a rebirth. Micronesians face a growing crisis as the ocean swallows their ancestral homelands. The community college is favored as an attractive, safe and cheap alternative to UH-Manoa. A fan of television history stops at nothing to keep old shows in top condition. The NC basketball coach last visited in December 1997, when his second-ranked Kansas team lost to Hawaii. Guy Toyama wants to educate people about renewable energy and aquaculture. The Hawaii Community Development Authority has proposed steep fees paid by boaters at Kewalo Basin. The DOE is reconsidering a newly prescribed school calendar.